A hypocrite is not known for what he says. He might say the correct things. A hypocrite is known for what he does. 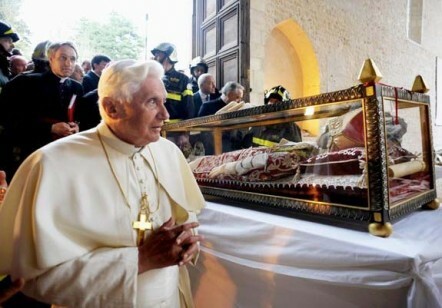 One of the present two Pope’s visits the corpse of Pope Calestio V, that is kept in a Church in Central Italy. 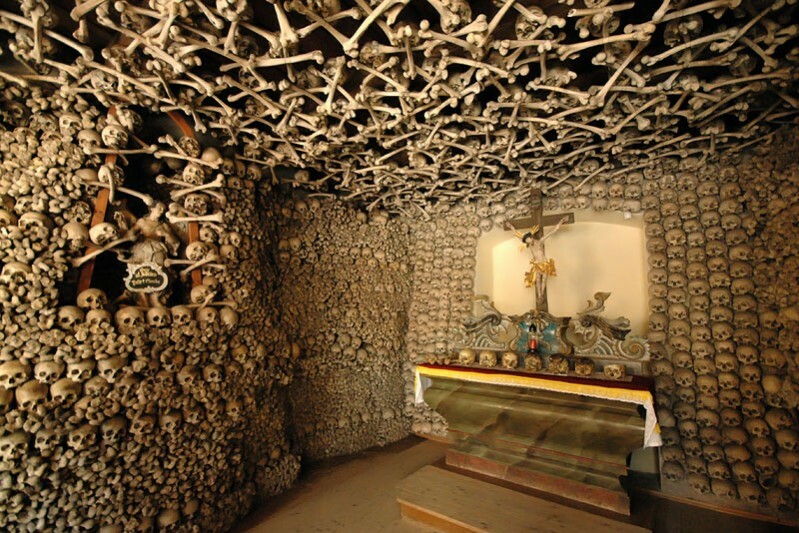 The most perverted religious people on Earth, are Vatican approved priests who worship skulls, corpses and bones. 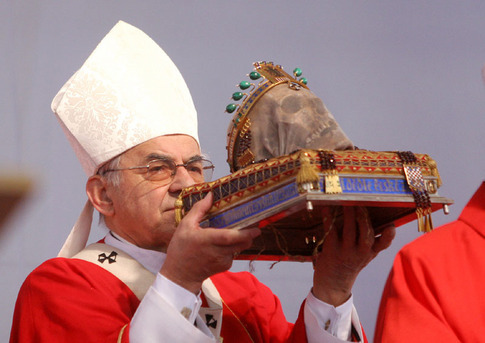 A papal bishop adore a beautified skull. The Bible is available for the Papal clergy. But since they have rejected the truth, God has handed them over to Satan, to become the devils priesthood. They live by their sinful nature, are lead into all kinds of falsehood, and even perversions. This is not fiction. This is a Roman Catholic chapel in Poland. The Holy Spirit will never back up this kind of religious movement. Vatican appointed priest’s and bishop’s are promoted as “holy men” and honored in public life. But but behind closed door’s they have indulged in almost not believable Satanic worship of the dead. Jesus the Messiah told the dead to go and bury their own dead. The hidden evils of the Roman Catholic Church seems to have no limits. Now Facebook and social media are exposing what have been hidden in darkness, and only been known to a limited numbers of insiders in Rome. 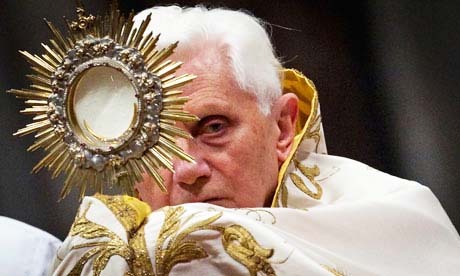 Take a look at the fruits of this dead cult, who has the Pope in Rome as its head. God of the Bible will surely not let Catholic priests off the hook. They must renounce this evil religious system, or perish. Still one billion people refuses to see the writings on the wall, and leave this false Church behind. The Eucharist with the sun, the crescent moon and the Pope. Falsehood from a to z. If you looked at the above links, you have seen the ugly display of wickedness, that for many hundred years was hidden from the public. Good Lord…. how horrible … I remember going into an Old Building in Arizona many years ago, as we got closer to the back of the building there was a skeleton encased in a clear coffin…besides the eeriness of the building supposed to be a Historic site..the smell of death was so strong…Shocking! this was an early time in learning to discern the spirits…but a lesson well learned.! People ‘with God’ are always referred to as ‘alive’ in the scriptures… so I don’t see your point. Remember during the transfiguration when Jesus spoke with Moses and Elijah (I believe it was them). They are your definition of dead, correct? The problem is that the english language is so ambiguous that we lose words like these. 10 Let no one be found among you who sacrifices his son or daughter in the fire, who practices divination or sorcery, interprets omens, engages in witchcraft, 11 or casts spells, or who is a medium or spiritist or who consults the dead. Sometimes Fundamentalists object to asking our fellow Christians in heaven to pray for us by declaring that God has forbidden contact with the dead in passages such as Deuteronomy 18:10–11. In fact, he has not, because he at times has given it—for example, when he had Moses and Elijah appear with Christ to the disciples on the Mount of Transfiguration (Matt. 17:3). What God has forbidden is necromantic practice of conjuring up spirits. “There shall not be found among you any one who burns his son or his daughter as an offering, any one who practices divination, a soothsayer, or an augur, or a sorcerer, or a charmer, or a medium, or a wizard, or a necromancer. . . . For these nations, which you are about to dispossess, give heed to soothsayers and to diviners; but as for you, the Lord your God has not allowed you so to do. The Lord your God will raise up for you a prophet like me from among you, from your brethren—him you shall heed” (Deut. 18:10–15). God thus indicates that one is not to conjure the dead for purposes of gaining information; one is to look to God’s prophets instead. Thus one is not to hold a seance. But anyone with an ounce of common sense can discern the vast qualitative difference between holding a seance to have the dead speak through you and a son humbly saying at his mother’s grave, “Mom, please pray to Jesus for me; I’m having a real problem right now.” The difference between the two is the difference between night and day. One is an occult practice bent on getting secret information; the other is a humble request for a loved one to pray to God on one’s behalf. Praying to a saint is simply asking them to pray for you, to intercede with God on your behalf. It is us asking them to hand our prayer to God through their righteous hands. There is no asking the Blessed Virgin to tell us what is going to happen with the stock market next week. See the difference? The best example of intercessory prayer is found in the Book of Tobit, which has sadly been hacked out of many Bibles on the authority of people who came along 1500 years after the Bible was written. But if you want to read about it, you can find it in chapter 12. The angel Raphael hears the prayer of Tobit and intercedes with God on his behalf. Reformers didn’t like scriptures that supported Catholic teaching, it would seem. Be advised that saints are not viewed as having any power to answer prayer. God is the One with the power. However, He permits, or rather, encourages the whole community to pray for each other. Why should that end when someone goes to heaven? That is precisely when their prayers are most effective, for they have been made fully righteous and the prayer of the righteous avails much. Saints in heaven plead with Jesus who is the one intercessor between man and God just as we on earth plead with Him. Henry, the problem is the book of Tobit is not Holy Scripture. It never was. Those 5 books the RCC accepts that one one else does are not even accepted as accurate historical books by the Jews since they were written. The RCC added them. Others did not remove them. Those books contradict other scripture (new and old testament). If you all would research those books and the lack of historical fact in them then the whole RCC system would fall apart. All the scriptures the RCC refers to to support their beliefs are further based on those 5 books. So in other words the false information in those 5 books has jaded the view of the individual who then reads the actual Word of God. Please, i know this hurts to hear and anger often is the response. I beg you to research those books and then cast them aside so you can read God’s Word anew! Thank you for this. There is so much false teaching to be exposed. I just found your blog and have added it to mine. Maranatha! Henry I am telling you you are very wrong ! You can not change the Word of GOD because you want it to mean something it slimpy doesn’t. I pray that God opens your eyes and ears to HIS Truth in the scriptures ! Catholisim has pagan orgins dating back to the time of Nimrod. Many symbols of the Catholic church are the same as that Babyloinia Pagan religion ! It is easy to research ! God’s Word never changes ! Catholiciam is a false religion leading many to everlasting separation from the ONE LIVING GOD ! It is sad the protestants or evangelical types are so hateful against the Catholic Church. This is nothing new. The only difference is going along with the crowd–being a follower–are those who want people to think they are holier than thou. I am glad Henry took the time to try to explain Catholics don’t worship saints or Mary. Henry, these holier than thou hypocrites will never listen. You tried. I gave up trying because I know that in the end days the Catholic Church will be attacked from within. ALLEGED “self-appointed” righteous will do the mocking. CBS Sunday did a story on Sargent Shriver this morning. His youngest son said that Shriver always said, “You have to take care of the internal to achieve the eternal.” I hope you have a chance to see the Interview online. Sargent Shriver went to mass every day. Peace be with you, Henry. Those who love Jesus Christ love His perfect and Holy Word and defend it. Part of defending it means that we do as Jesus tells us to do — and that is to EXPOSE THE LIES OF THE CATHOLIC CHURCH. No one here hates “Catholics” — they hate SATAN and his lies. Sadly, you are too blind to see that because you have added to God’s Word with the blasphemous traditions of men. How can you read this website and look at the photos and still defend it? I will tell you how. It is because you are not filled with the Holy Spirit due to following lies and therefore God has turned you over to your own deception. The counterfeit “mary” in the Catholic church is a demon spirit, satan’s masterpiece of deception and will be responsible for millions and billions losing their salvation. This fake “mary” has nothing to do with the Biblical Mary and has has usurped Jesus’ role as Lord and Savior. Yes, you do worship “her”. You pray to “her”. You get down on your knees before “her”. Your “organization” kisses vials of blood from a dead pope. Your leader the pope is a liar who is guided by the occult and satan and is role is to lead as many as he can to hell. God shares His glory with NO ONE and that includes “mary”, saints, popes, rosary beads, confession, priests, etc. You are worshiping demons unaware. Run from the Catholic church before you are left behind. There is no truth there. It has nothing even remotely in common with what Jesus taught. It is a cult, some lunatic fringe demonic teaching. Perhaps the worst thing about it is that it “calls itself” Christian in an attempt to deceive those not filled with the Spirit, those who have succumbed to fear, lies, and misdirection. Sadly, so many associate this disgusting mockery with true Christianity. Satan is the father of all lies and you have been duped! REPENT and don’t add even one letter or blasphemous ceremony like the “eucharist” to God’s Word that He didn’t intend. Hell awaits those that do. You’d base your valor to CBS and Sargent Shriver?? and not Jesus Christ..wow! wow..well you base your Eternal Destination to a Murderous Child Abusing Pope led Faith instead of Jesus Christ, reckon it’s only natural you’d trust CBS News and Sargent Shriver & his off-springs too! sad indeed! Henry, And, there is a vast difference between ‘asking the “virgin Mary” in Heaven to pray to Jesus for you’ as opposed to ‘Praying to JESUS yourself, and asking other Believers around you, in the Church, to pray for you.’ Henry, the work that GOD gave to Mary, the Earthly mother of YAHUSHUA (JESUS), to do has already been completed and she now RESTS from her labours in the Heaven. Whatever she is doing now, is only within the confines of Heaven. Whatever GOD wants done now, in HIS Church, with HIS people, is done within the Church itself, by thew Power and the Presence of the Holy Spirit, by asking GOD HIMSELF directly. The only Mediator between GOD and mankind is the Man JESUS (YAHUSHUA). People of real religious value. You people seem to believe you are so knowledgeable about God and cast your judgment down so easily. I’m sorry but do any of you remember thou who is without sin may cast the first stone? No? Yea, bc you all are so quick to judge. So how bout you do a little research on the take over of the catholic faith by the elitist of the world, and maybe some sense might be knock into your thick righteous skulls and save yourself from eternal damnation by not casting judgment so easily anymore. Why don’t any of the links work in the article??!!! Very interested in their info please help! The links do not work, because I have re-publsihed the articles. That has given them new URL-s. You will have to read the articles by cliking on the horribel skull at the left hand column. Sorry for the trouble. No problem, thank you for the quick response! The Capuchin Crypt of Santa Maria dell’Immacolata Concezione in Rome. The crypt contains six chapels, five of which are decorated in the bones of the deceased friars. And by decorated I do not mean a few bones placed in reliquaries. No, they went all out. Just look at the names of these chapels: Crypt of the Skulls, Crypt of the Pelvises, Crypt of the Leg Bones and Thigh Bones, and the Crypt of the Three Skeletons. The bones of over 4000 monks who died between 1528 and 1870 artistically line the walls and ceilings. They have chandeliers made of bones, arches, floral arrangements and even a clock, all made from bones. Some of the monks are still intact. These are in various poses. Some resting in niches, some mounted on the wall and a few are hanging from the ceiling. While some, perhaps most, may find this display macabre, the message is simple, if a little eerie: Noi eravamo quello che voi siete, e quello che noi siamo voi sarete. That is, “We were what you are; and what we are, you will be.” No one else is buried except the monks that are hanging around. Whatever it is, it has no power, because its an illusion ascribed to the confine of the material comprise. But, rather, focus upon things above, thats how you show Gods love.